Awards ceremony show live on bbc.co.uk/sportwales from 19:30 GMT; Live video and reporting on bbc.co.uk/sportwales; BBC Radio Cymru & BBC Radio Wales; announcement on BBC One's Wales Today and S4C's Newyddion. Repeated on BBC Red Button at 22:00 GMT. Voting for this award closed at 18:00 GMT on Saturday, 6 December 2014. The winner of BBC Cymru Wales Sports Personality of the Year 2014 will be announced on Monday, 8 December after a public vote which has now closed. He or she will be revealed during the Wales Sport Awards, an event in which BBC Cymru Wales and Sport Wales celebrate Welsh sporting success. Footballer Gareth Bale who became the first Welshman to score in a Champions League final. A hero among Real Madrid's fans, the 25-year-old scored a vital goal in extra time to beat off rivals Atletico Madrid in the Champions League final, and scored the winning goal in the Copa del Rey final against Barcelona. And he has played a key part in all of Wales' qualifiers for Euro 2016. With team golds in the World and European Track championships, plus the World Cup and the Great Britain event, cyclist Elinor Barker is a recent winner of our Junior Award. At the Commonwealth Games in Glasgow she won a bronze and silver medal individually. The 20-year-old has made 2014 the year she established herself among the elite of womens cycling. 2014 was the year it all came right for swimmer Jazz Carlin. Overcoming illness and injury plus her coach moving to Australia, the 24-year-old first picked up two golds in the European Long Course Championships. Then she became the first Welsh female swimmer for 40 years to win aquatics gold in the Commonwealth Games in the 800m freestyle, followed by silver in the 400m the next day. In the space of a few months mountain bike specialist Manon Carpenter won the Mountain Biking Downhill World Cup series and was gold medallist at the Mountain Bike Downhill World Championships. The 21-year-old from Caerphilly achieved this success only three years after she won the junior equivalents in 2011. Swimmer Georgia Davies shone at Glasgow 2014. The Commonwealth Games 100m backstroke came first where Davies finished with silver. Three days later, the chance to go one step better came around and the 23-year-old won gold in the 50m backstroke. After a 40-year drought, Wales now had two female swimmers as Commonwealth Games gold medallists. Golfer Jamie Donaldson struck the shot which won the Ryder Cup for Europe. The defeat of Keegan Bradley ensured Donaldson won three of his four games at Gleneagles despite his rookie status. The 38-year-old from Pontypridd has sneaked up on the golfing elite in recent years. Consistent top order finishes - rather than flashy wins - had put him near the top of the Order of Merit and he had sealed a place in the Ryder Cup team with victory in the Czech Masters - a perfect end to a momentous season for Jamie Donaldson. Cyclist Rachel James is the latest Abergavenny resident to make her mark on the world cycling stage, and she did it a long way from home. Aguascalientes in Mexico was the setting for Rachel's two para World Championships gold medals this year - piloting Sophie Thornhill to success in the tandem kilo and tandem sprint events. James, who is sister of twice-world champion Becky, teamed up with Thornhill later in the year to pick up two more golds at the British National Track Championships. Rhythmic gymnast Frankie Jones won one gold and five silvers to become the most successful individual Welsh athlete at the Commonwealth Games. Glasgow proved to be a golden end to the 24-year-old's career. Wales' flag bearer at the opening ceremony, Jones won silver after silver - but gold seemed elusive - until the ribbons. She then scooped the David Dixon award for outstanding athlete of the Games based on performance, fair play and overall team contribution. Judoka Natalie Powell won Wales' first judo gold in the history of the Commonwealth Games. The Cardiff University student had progressed through the rounds to secure a -78kg final showdown against England's Gemma Gibbons. Powell, 24, defeated the 2012 Olympic silver medallist in a tense final to secure Wales' second gold of the Games. Powell also went on to win gold at the World Grand Prix in October. Cyclist Geraint Thomas became the first Welshman to win cycling gold at the Commonwealth Games. A matter of days after claiming his highest-placed finish in the gruelling Tour de France, he won bronze in the Glasgow 2014 time trial, and was one of the favourites in the road race. But disaster struck. Having broken away, Thomas suffered a puncture, but with the pack gaining on him, he had time to replace the wheel and cross the finish line first. He was then made Wales flag-bearer for the closing ceremony. The Wales Sport Awards will be held at the Sport Wales National Centre in Cardiff, on Monday, 8 December from 19:30 GMT and the event will be reported minute-by-minute and streamed live online at bbc.co.uk/sportwales, with a repeat on BBC Red Button at 22:00 GMT. As well as the transmissions above, the winner will also be revealed on BBC Radio Wales, BBC Radio Cymru and appear later that evening on BBC Wales Today on BBC One Wales and Newyddion on S4C. Other awards to be presented on the night include Coach of the Year, Team of the Year, Junior Sportsman and Sportswoman of the Year (Carwyn James Award), Lifetime Achievement/Merit. Please note the event is not connected with the UK Sports Personality of the Year and is for the Wales award only. 1. Voting will be available by telephone and text message from 0800 GMT on Monday, 1st December 2014 and 1800 GMT on Saturday, 6th December 2014. The candidates list will be promoted across BBC Wales output from Tuesday 25th November 2014. The numbers to call in order to vote for your candidate will be published on Monday 1st December 2014. 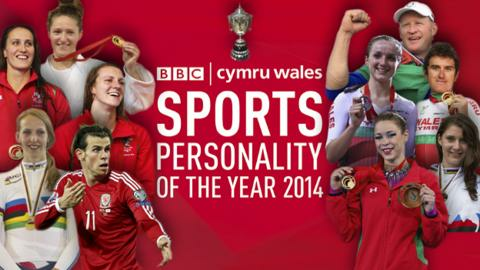 The winner will be announced on BBC Radio Wales at the Wales Sport Awards presentation on Monday night, 8 December 2014. The result will also appear online around the same time. 2. Voting is by telephone and text message only. Please note that you cannot vote by email, red button or via this website. Votes will be capped at 5 votes per caller per voting method. 3. Telephone and text votes will open and close as specified above. Votes received outside the specified times or exceeding the maximum set out above will not be counted, but may still be charged. Voting times may change. 4. The BBC reserves the right to cancel or suspend voting at any time. 5. The vote is open to all residents of the UK, including the Channel Islands and the Isle of Man. Please note that BBC employees, their close relatives or anyone directly connected in any way with the production of the programme or the provision of fixed line or mobile telephony services to the programme are not eligible to vote. 6. Each phone vote costs 10PPC from a BT Landline, other networks may vary. Calls from mobiles will be considerably higher. This table is provided for indicative purpose only. Information provided by mobile network operators. For up to date information it is always advisable to check directly with your network operator. Texts will be charged at your standard message rate. Check with your network provider for exact costs. 7. Voters must obtain permission from the bill payer before voting. Voters aged 12 or under should obtain parent/guardian consent before voting. 8. If you are viewing the programme through iPlayer or any other time-shifting or catch-up service you should check carefully whether the vote is open before doing so as it may have closed. 9. Make sure you dial carefully only the number or type carefully the short code / keyword combination of the person you wish to vote for. 10. You can vote up to a maximum of 5 times on your telephone or your mobile. The BBC reserves the right to disqualify votes if it has reasonable grounds to suspect that fraudulent voting has occurred or if it considers there has been any deliberate attempt to manipulate the result. The BBC can only guarantee that votes individually entered directly through the telephone numbers or short code / keywords promoted by the programme will count. 11. There are a number of contingencies which could occur. These may include the decision reverting to a back-up panel formed by people from the sports sector, in the event of problems with the phone or text vote or in the event of a tie. Any such use of contingencies will be declared. 12. For the purposes of verifying any claim for refunds (where offered) or investigating possible voting irregularities, the BBC may need to request the network operator to disclose the telephone number that you are voting from. Please note that this will still be required where you have originally opted not to disclose your telephone number (caller's line identification barring). If you do not agree to this, you should not vote. 13. The BBC, its sub-contractors, subsidiaries and/or agencies cannot accept any responsibility whatsoever for: (i) any technical failure or malfunction or any other problem with any telephone network or line, system, server, provider or otherwise which may result in any vote being lost or not properly registered or recorded; and (ii) any of the nominees withdrawing from the event or refusing to accept the award for any reason. 14. The voting in this programme accords with the BBC's Code of Conduct for Competitions and Voting, details of which can be found on the BBC's Standards and Guidelines website.